I generally describe Grisham’s books as mind candy, easy reads without a lot of substance or literary merit that are perfect for the beach or an airplane and are eminently entertaining. While many successful best selling authors that crank out a book a year tend to devolve into formulaic predictable stories that have caused me to avoid more recent publications [Patricia Cornwell and James Patterson come to mind], Grisham has managed to maintain my interest by his creativity and delving into some new aspect of the law with each new novel. Sycamore Row returns us to the cast of characters first introduced in Grisham’s freshman effort, A Time To Kill, which was published in 1989. Three years after winning an acquittal for Charles Lee Hailey, Jake Brigance is once again drawn into a legal morass of black vs. white in the small southern town of Clanton, Mississippi. Seth Hubbard, who composed a hand-written holographic will disinheriting his children and leaving millions to his Black housekeeper the day before hanging himself from a sycamore tree, has specifically requested that Brigance represent his estate and ensure the terms of his will are carried out. Naturally, the disinherited heirs counting on the millions hire big city lawyers with questionable ethics to prove the will is either a forgery or the result of undue influence on the part of the beneficiary. With this much money at stake the piranhas are creeping out of every corner. Jake is determined to fight for his client – the estate. Grisham is at his best describing the machinations of the court system, the partiality of judges, the biases of juries, and the lengths to which many lawyers will go for money and to win at all costs. At its very basic, litigation is a game with winners and losers and playing by the rules is not always rewarded. 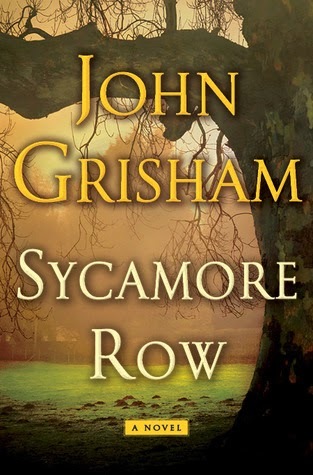 Sycamore Row is Grisham at his best. This book was much better than I had anticipated after his having spent nearly 15 years at the top of the best sellers lists.